Since his election as Mayor of London Boris Johnson has been pushing the attempt to build a new massive airport in the Thames estuary. Together with the idea of closing Heathrow it was intended as a vote catcher. However, the reactions of airlines, passengers and airport workers alike have been extremely negative. 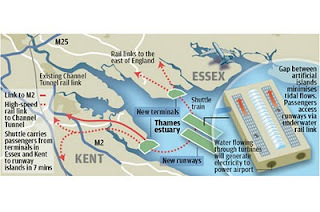 As can be seen by the drawing(courtesy of the Evening Standard) the runway layout meant that the take off/landing patterns were configured to be SE-NW which meant the flights paths took planes away from the capital to the detriment of the residents and workers of Essex and North Kent - not to mention the interference this implied (with possible closure) of Southend, London City and Stansted airports. It conveniently forgot to mention that the runway layouts at London City, Heathrow and Gatwick are all East-West while at Luton and Stansted are NE-SW. Well Mayor Boris has recanted (Evn.Standard) and dropped the idea from his agenda. The principal objections dealt with weather conditions(winds and fog etc.) while wildlife and their habitats were also a negative factor (disturbance of wildlife habitats and the danger of bird strikes for the aircraft - no small worry). Couple those factors with the fact that no airline wished to fly there, no passengers wanted to have to travel so far out to catch planes and nobody wanted to have to work there. All combined to conspire for the downfall of the plans. Of course, when the public enquiries were held for Maplin Sands and Stansted Mayor Boris was still in his cot so will not remember the enquiries. Any repetition of those enquiries would be wasteful, time consuming and expensive especially when the old reports can be found in the archives of the Dept.for Transport, dusted off and presented again. We insist, though, that all the previously mentioned factors are still very much valid arguments against the Maplin madness. S tansted is a different case. 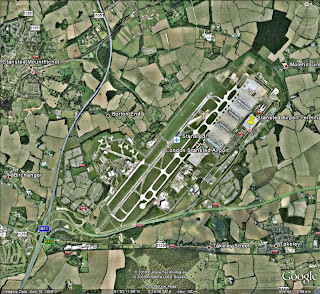 Stansted was originally looked at as a substitute third London airport for all the others and was rejected. We do not remember the principal reasons for rejection but it should be remembered that the original idea was for a four runway airport. Some are possibly still valid. We seem to remember that the objections were several including too much destruction of the green belt and too much dependence on an inadequate infrastructure - roads and railways etc.It should be pointed out, however, that Stansted has indeed been expanded greatly and very probably much more than was anticipated - very much by stealth. It would be interesting to look at the relevant report and compare the traffic predictions for 2008-10 with the actual figures. Our thesis is based upon the fact that the South East region has an enviable infrastructure in airports and which should, therefore, be developed upon. Much is talked about Paris CDG, Amsterdam Schipol and Frankfurt Main airports. However, which city or region in the world can boast four major airports and one commuter one? Answer - none. New York comes close but that is all. To ignore, or worse to rubbish, all this accumulated capital and human investment would be criminally wrong and shockingly wasteful. What is it that makes politicians or business leaders want to construct macro macho white elephants? Why do people want to funnel everything into bottlenecks which would encounter at some future date the need to expand without having the means to? Without mentioning other airlines, do not Easyjet and Ryanair already fly from three London airports serving both the capital and the region in which the airport is situated? For these considerations we are in favour of freeing up the process so that the airports can decide whether they need a second runway or not. Even though the new owners of Gatwick have put on hold the question of a second runway after 2019, they should not be bound by any legal agreements imposed on them except for the normal and usual one of a public enquiry. Therefore, we would be in favour of permitting Stansted, Gatwick and Luton to expand to two parallel runways. The necessary land for a second runway with anciliary facilities should be reserved permanently. Thus a real airports strategy can be provided for the South East and London. In the Dept.for Transport´s paper of November 2007 "UK Air Passenger Demand and CO2 Forecasts" it states "National demand, unconstrained by airport capacities, is forecast to rise from 228mppa in 2005 to 495mppa in 2030". Even while not looking at the details should this not be warning enough that demand for air travel is forecast to double. The South East will not be at the margin of this demand despite many attempts to divert traffic to regional airports. The airports should have a greater say in their own futures.Having different owners means thay can compete to attract traffic. The market should then play a greater role in maintaining airport usuage prices low. Each region in the SE would have on offer a greater range of destinations specialising in freight, passenger leisure or passenger business segments as it sees fit. If we see Luton, Gatwick and Stansted increasing their runways to two each then that brings us to the need for a third runway at Heathrow, in which we are in favour. The present situation has arisen because there is no clear strategy for airports in the SE. If there were then planning on other related infrastructure could go ahead with clear objectives - which is not the present case. The three large British airlines are British Airways, Virgin Atlantic and BMI. 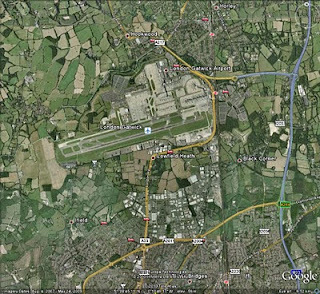 The first two have bases at both Heathrow and Gatwick. In fact at one time BA made a serious attempt to make Gatwick a second hub to no avail. The reasons are various. The most important are that there is greater desirability for the connections provided through Heathrow while this was not possible at Gatwick due to the lack of foresight by prohibiting the construction of a second runway there. Neither could the fully loaded jumbos take off from the runway nor were the slots available to provide more services from the single runway. Truely this was a short sighted victory for the "nimbys" which lands us in the present situation. 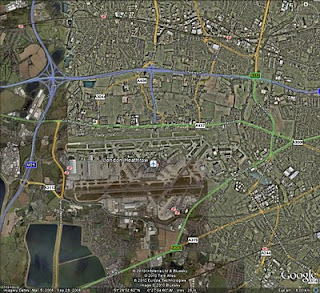 Now that Heathrow has been "opened up" the US airlines have debunked from Gatwick to Heathrow. 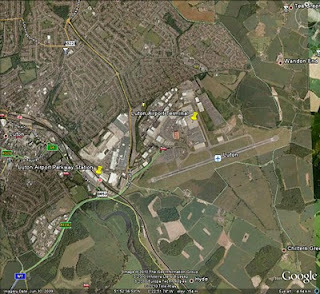 A most unsatisfactory situation for Britain´s second airport. At present two Heathrow runways are at 99% capacity while so many airlines want to, or have a right to fly there(through gov.to gov agreements) thus the demand for a third runway is obvious and urgent. The present tendency is to use the slots for intercontinental flights to the detriment of short haul flights. This is a chicken/egg situation. You cannot provide the long haul flights if there are not the short haul feeder flights whether they be from the British Isles or elsewhere in Europe. So to provide the service for London originating/destination passengers and transit passengers a third runway should be built as soon as possible. Maybe there should be some sort of legal restriction on the use of the third runway to ensure that the users really do provide a service from the outer reaches of Great Britain and Ireland, the Channel Isles and the Isle of Man. These should take preference over other short haul flights as there are no other solutions in these cases. It should also be noted that the much vaunted link to mainland Europe, while necessary, is very tenuous as has been proved twice in recent months - the fire which closed the tunnel and the trains which had problems with snow this winter. The conditions already laid down about restrictions on the use of the third runway are correct. Both noise and toxic pollutants from aircraft have to be looked at very seriously. The suffering residents and workers of the overfly areas should not be put under greater onerous conditions. These restrictions(about noise and toxic pollutants) are then valid but should be also valid for all airports in or near built up areas. Would it not then be environmentally logical as well as politically expedient to state that these restrictions are the first step to applying them to all UK airports starting with the ones nearest to or in built up areas? – ie. 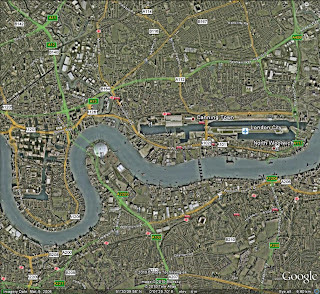 Heathrow and London City. The time lapse to extend the restrictions over the whole country might be extensive but at least it would be a stated intention which could well be applied throughout Europe. Europe at present bans certain aircraft from certain countries for safety reasons. Would it be unreasonable to ban types of aircraft for environmental reasons? In the long term the question of further expansion at Heathrow would be a non-starter. Therefore, expanding one of the other airports with the same role in mind would have to be analysed. That, however, is a further question to be looked at on a different occasion.